Come and join us in one of our FREE community family tennis sessions. It’s a great way to help get the family fit and an opportunity to meet new people. The sessions will include mini tennis courts and tennis factory equipment for all the family to enjoy. The sessions are open to all North Tyneside resident families; no previous experience necessary. 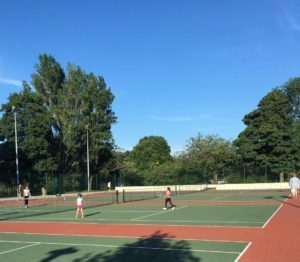 All tennis equipment is provided and there is a qualified tennis coach on site to offer advice on improve your tennis skills. There is no need to book just turn up and give it a go! For dates and times of further sessions; please check back with us next season! For further information please do not hesitate to contact the team via email: active@northtyneside.gov.uk or call us on (0191) 643 7171.